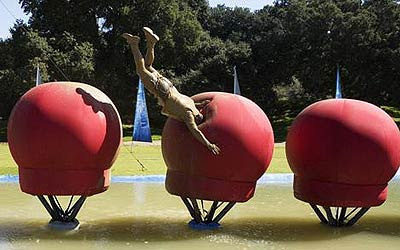 With Wipeout coming to Canada I've seen my share of audition tapes for the up coming series. It's been getting a lot of attention on local radio, Facebook and YouTube in particular where everyone has been campaigning for attention throughout July. Among these folks have been two good friends of mine, Tyler and Darcie, who each uploaded a submission tape of their own. Even more exciting, so far Darcie has received a callback for a chance to be on the show - we still have our fingers crossed that Tyler gets one too. But no matter what happens, I'm pretty impressed with both of their efforts to get noticed. It would be pretty cool watching (and ultimately laughing) as they got battered along the Wipeout Canada course - and hey, they'd have a chance at $50,000! This could be them on the big balls! Fingers crossed for both of you! You can see their submission tapes below. First off, Darcie is squeeling with delight that she has finally been bestowed the great honour of appearing on Editing Luke! I am no stranger to being showcased and ultimately the star of your blog, but I can understand how exciting it is the first time. So to that, we both say thank you. It's been quite a ride so far but ultimately if I don't make it I will let you run me down with your car so you can see me flip through the air anyways. (I will understand if you want to put padding - for the Jag, not me of course). You guys are both crazy, haha.